they're good for? These have WPM and a bit of botritus on the tips. on top, is it plastic over wire? I am doing research ahead of maybe bidding.. there is no poopy to this prospect. I was totally unaware of the kerfuffle that went on in warren. thank you. residence is 375 yards. From the front door of the school house to the house's back chain link is 1531 yards. The distance from the edge of the schools property to the edge of the house's property line is 120 yards and across the street. Where does measuring for a sufficient distance between house and school begin? patients with their 12 must register as growers? the city they are in must inspect the 12 and issue a license with annual renewals? they must pay a 3% tax on the value of the smoke they consume? 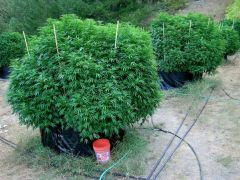 Pats with 12 must report seed to clone to weight harvested and on- hand is limited to 2.5 oz? just repeating what i read on another site. flippity-flop concentrates and other aspects, copied from colorado. the one grower i know who is automated says he gets 4 HOURS of work cut his trim time.. hIS TRIM TIME IS DOWN from 5 hours to one. i tried them and found that i caaaaaaaaaaan't roll a joint and that level of finger dexterity is MANDitory to use the bomsai. as soon as ur wearing bracelets leo offers assuranes that if you gives names of others they will let u go if u let u give them tips. They attermpt to climb the ladder and get the name of someone who has more assets to forfeit than u.
tougher than colo. we home growers be dead. Is Your Fave Strain On This List? I had a list of 50/50 hybrids, and recently lost it. I had compiled it over the past 5 years, adding strains to the list as i came across them in the normal course of events. Now I hope that you (or someone) knows where to find such a list ready-made creature? No More Help For Female Growers From Me. Today I am in a ruminative mood, seeking to draw lessons from the last 6 years. Most i will keep to myself. One huge time-waster [with no exceptions]. Never take on a female-wannabe grower to mentor. I define a successful mentorship as the individual is still growing their own weed needs 3 years later. In my case 100% of the 9 females i lavished with help and some supplies are not growing today. To be totally transparent, I had no relationship beyond grow-mentor. 7 were white and 2 black. One lasted 2 years and she disappeared. Literally, her house is still standing and vacant (she owned it); her phone and email shut-off. So maybe she is growing elsewhere. That would make i of 9 who survived, but would not change my analysis. Guys are nearly 100% opposite.